In her sophomore year things really took off when Chloe became Editor at Large. 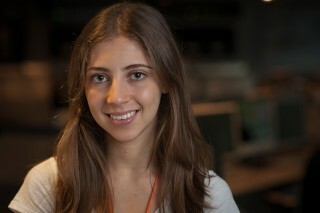 Her paper staff began entering the local contests held at universities such as Adelphi and Hofstra. Chloe couldn’t get enough of winning so she applied for the Hank Logeman Award. The News12 Hank Logeman Award is a $2,000 scholarship that is awarded to a student who demonstrates outstanding achievement in print, television, radio, or web media. While doubtful of winning, Chloe entered the contest and actually won. “Into the college funds it went,” she said, laughing. “I went to this awards dinner hosted by the Press Club of Long Island,” said Chloe. “It was amazing.” She got to meet all of the newscasters and professionals who she looked up to, such as Newsday political reporter Rick Brand. The dinner fanned her desire to become a journalist. Chloe’s interest in journalism wasn’t predetermined. Said her mom, “We just knew she was very bright, and we just knew she was very determined.” In her future journalism career, Chloe wishes to pursue print or broadcasting. And it all started under covers with a flashlight, a book, and a passion.